If you've upgraded your Trello team to Trello Business Class and you're looking to onboard your team as smoothly as possible, you are in the right place. If you're a visual learner, feel free to check our Business Class webinar here. Here's a run down of the topics covered in the article. The first thing you will want to do with your new Business Class team is adding your colleagues as members. Click the "Members" tab from your team's page to get started. Please note that the Business Class subscription is per-team-member, which means that every person that you invite to be a member of your team will incur an additional charge. You can check how billing works with Business Class here. You can add members to your team by clicking the "Add Members" button on the member's page. Add members by entering their email address or Trello username. 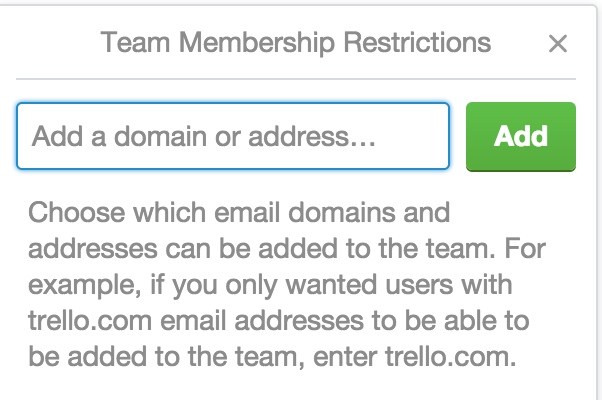 Individuals that are not already signed up with Trello will receive an email inviting them to sign up for Trello. When they create an account they will automatically be added to your team. Who do I need to add in my team? Anyone you'd like to give full access to all Business Class features and control with Business Class permissions. First, you’ll need to add the Trello Business Class app from the Google Apps Marketplace to your domain. The "Go To Google Apps Marketplace" button on the Link To Google Apps domain popup will get you there. When there, be sure you are signed in to the Google account with the domain you want to use. Click the “Add it now” button then follow the prompts. You’ll see other users from your Google Apps Domain on your members' page when configured correctly. 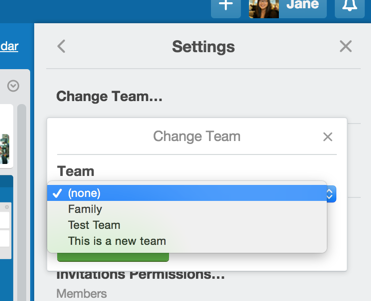 Once you have added and invited members to your team, review the team level permissions for your members. 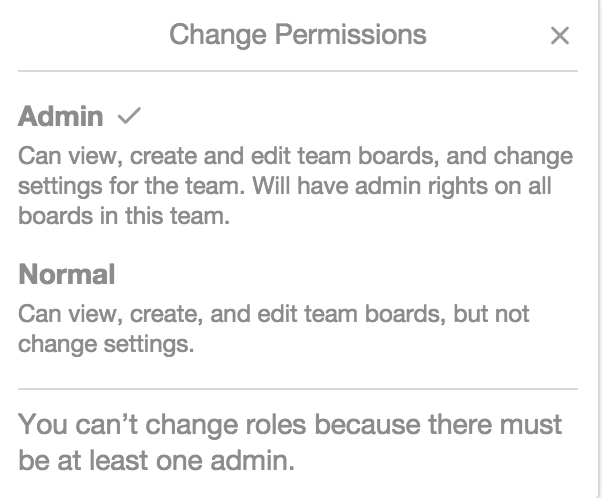 Team admins are able to set team-wide permissions, change settings for all boards within the team, and add or remove members. It is always good to have a couple of other trusted members with admin privileges in case you are unavailable to administer something at the team level. To set team level permissions for members, click the button to the right of the member's name that either says "Admin" or "Normal" and adjust accordingly. 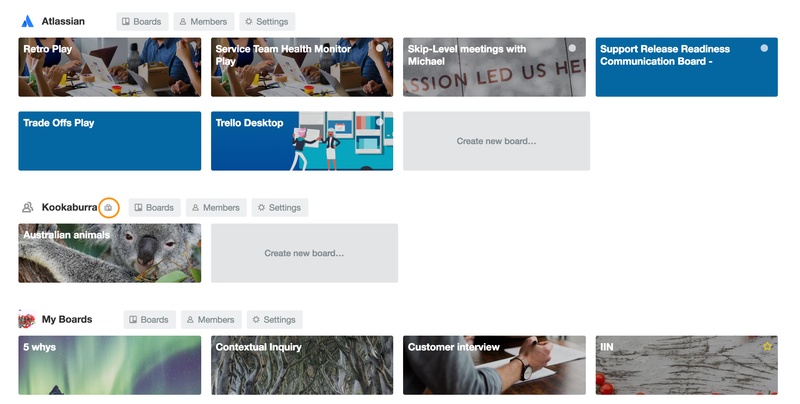 It is likely that members of your team created Trello boards for projects before your Trello team existed and now is the time to associate all of those boards with your team. 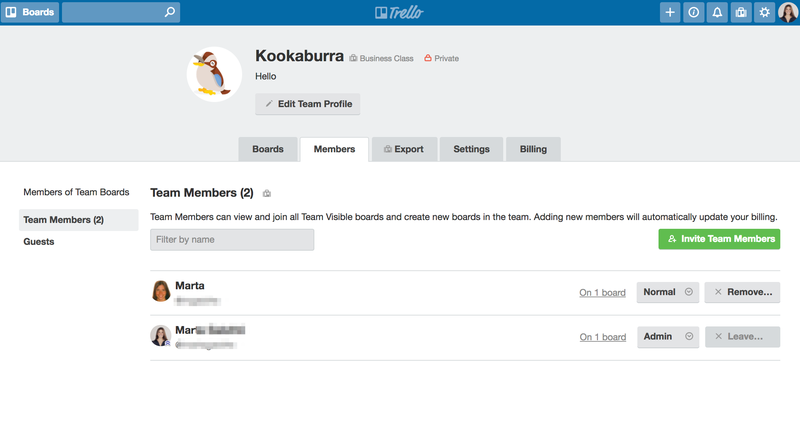 Once all of your team's boards are associated with your Trello team (you should see the teams' name next to the board's name), you will have admin privileges over all of the boards in your team and your team members will be able to easily view other team-visible boards. For any board where you are the admin, open that board and on the board's menu click "More" then "Settings". In the board's settings, you will see the option to "Change Team.." where you can select the team that you would like your board to be associated with. Select your team and repeat this process for all of your boards. If there are boards that should be associated with your team that you are not the admin of, you should contact the admins of those boards and ask that they follow the same steps to associate their boards with your team. Click on the "Add members" button to invite people to your boards and start collaborating. You can add a member as Admin, Normal or Observer. Type their email address or username and then select the arrow from the options right to the right. 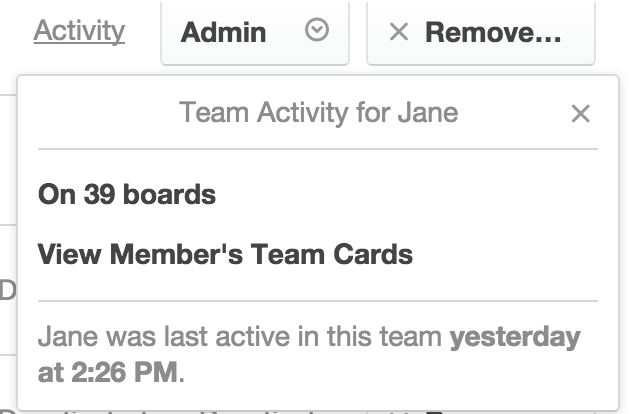 Admins can view and edit cards, remove members, and change board settings. Normal members can view and edit cards, but can't change board settings. Observers can view, comment, and vote on cards. However, they can't move or edit cards, nor can they change settings. Observer status makes it easier to share boards and information with clients and vendors. Give people the ability to view, but not modify, private team boards, without needing to make the entire board public. You can even invite people outside the team to be an observer on a board. However if the Observer needs to be added to more than one board, they will then become a Multi-Board Guest. Because Business Class upgrades are per-team, you will not be charged for board members that are added to only on one board in the team. You can change current board members permissions by clicking their avatar in the right sidebar, selecting “Change Permissions”. To add a member as an observer, open a board, click on the "+" sign on the top menu, find a member, click on it, select "Add as Observers" from the drop down menu below the. 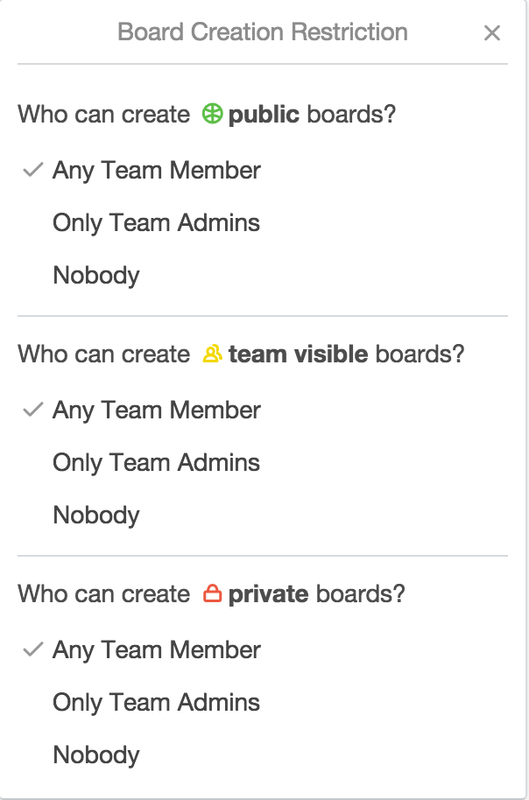 By default, team members can't collaborate on boards unless they are added as a board member. 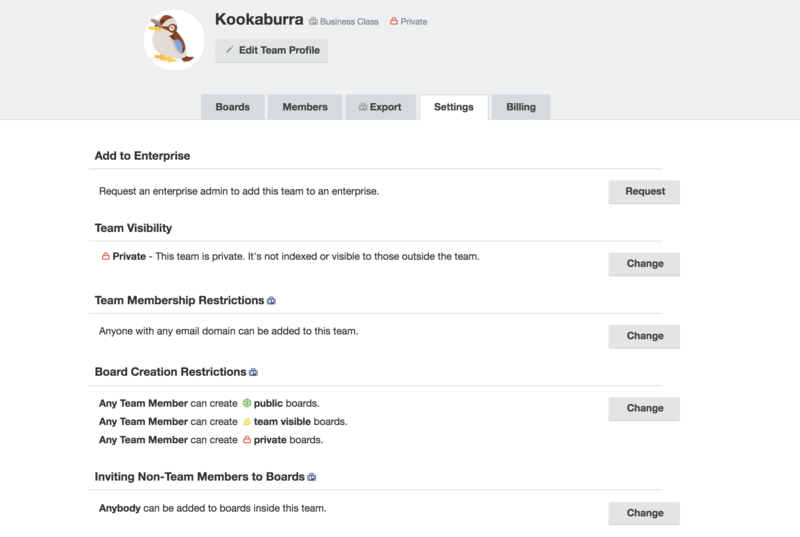 If you don't want to go through the hassle of adding everyone to boards in your team, you can select "Allow Team Members to Join" in the settings menu in the sidebar of any board. 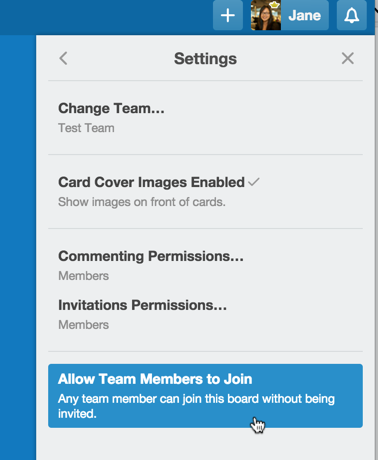 Set "Allow Team Members to Join" in each board's settings. 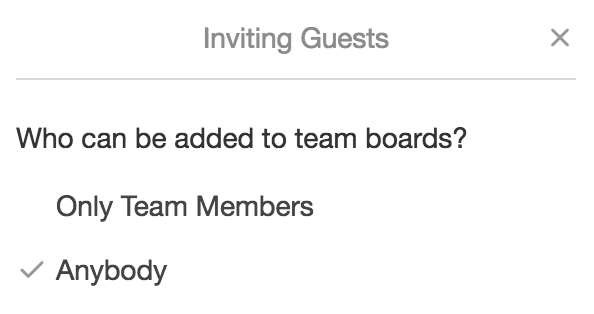 This will give team members the ability to join boards in the team themselves. You will have to do this for each board on your team individually, but it can help save a lot of time in the long run. Power-Ups give you the opportunity to integrate applications you use on a daily basis right into your Trello boards. While boards on free teams can turn on one Power-Up at any time, boards on Business Class teams can enable unlimited Power-Ups per board. See Power-Ups by Trello for more in-depth descriptions. Keep up to date on what projects your team's members are working on. Visit the Members tab to view when a member was last active in the team. You’ll also be able to see what boards the member is a part of and view the member's assigned cards from that page. Set the team-level permissions for members, boards and invitation restrictions in the "Settings" tab on your team's page. This will help make sure that only the right people are added to your team and boards, and that no one is creating public boards if they shouldn't be. First, set the "Team Membership Restrictions". This enables you to limit membership in your team to only people with email addresses from your company. If you want, you can even limit membership to only specific email addresses. For example, if you only want users with the yourcompany.com email address to be able to be added to your team, then enter yourcompany.com. Next, click "Board Creation Restrictions" to set the permissions for who can create public boards, team visible boards, and private boards. You can choose any team members, only team admins or nobody for each option. Finally, set the permissions for "Guests to Boards". You can choose to allow anyone to be added to boards associated with your team, whether or not they are a member of your team. Or you can set it so that only members of your team can be added to your team's boards. Please be aware that by selecting "Don't Allow" you will not be able to add observers to boards within the team. Download all of your team's data at once, including boards, cards, members, and attachments. To do so, click the Export tab. Your team's boards will be exported in both JSON and CSV formats, and all of your card's attachments will be saved in their native file format. You will also have a history of any past exports available for easy access to your team's data. 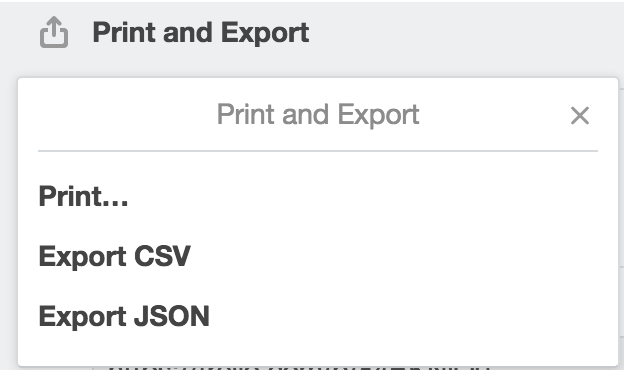 In addition being able to export individual boards in JSON, as a Business Class subscriber you can export individual team boards in CSV format as well. CSV exports can easily be opened in applications like Excel. To see what a board export in CSV format looks like, we have exported the Welcome Board that comes with each new Trello account. You can download the .csv file here. 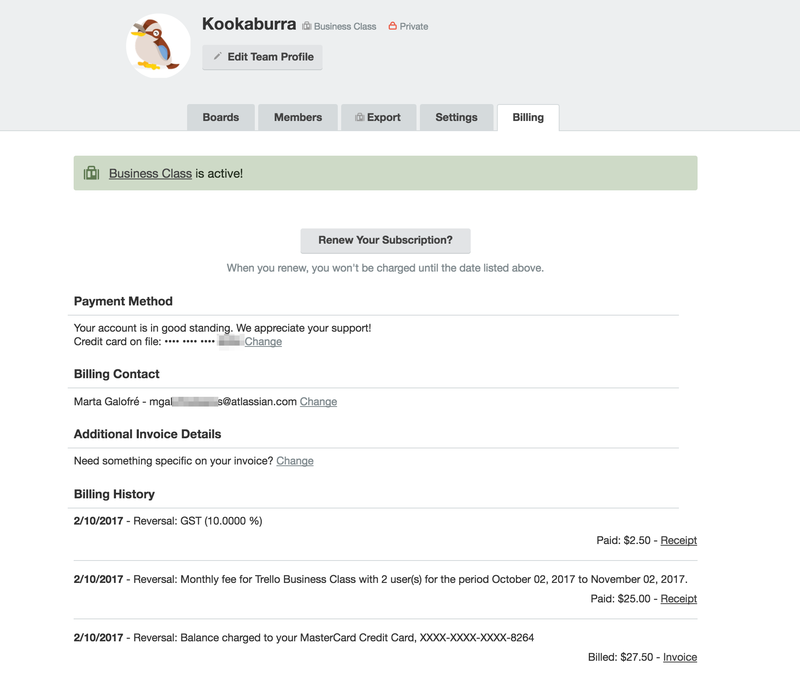 When you upgrade your Trello team to Trello Business Class you have the option to choose between a monthly or yearly billing plan. The cost is per team member, so you'll be billed for every additional member you invite to the team. When you navigate to the billing section, you'll be able to access and edit your payment method, your billing contact, billing history and receipts, as well as add any additional invoice details you need for your business. Here you'll also be able to cancel your Business Class subscription. Business Class is an upgrade for teams. This means that you're upgrading a specific team within your account instead of your account as a whole. For example, you could have one Business Class team in your account, and two Free teams, like the example below. See the suitcase next to the Team's name? That's the Business Class team! If you'd like to learn more about how billing works, please refer to this article: How Billing works with Trello Business Class. Customers with Business Class get priority email support, meaning we’ll make sure your questions get answered within one business day, guaranteed. 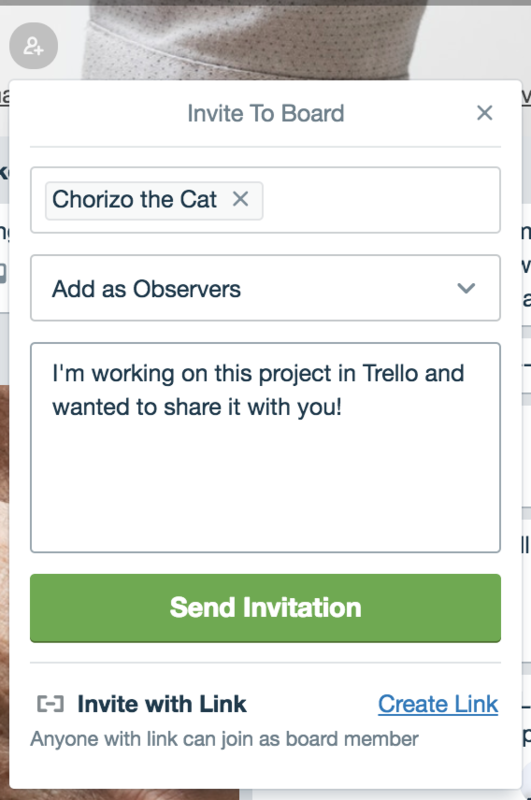 Do you feel you need help getting started with Trello or want to share what you expect to get from Trello so we can provide ideas and inspiration? Please let us know! We look forward to learning more about your needs and help you succeed, for real!